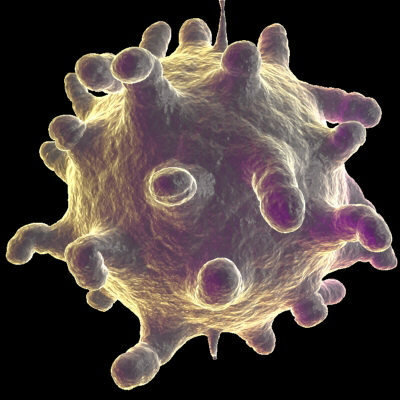 Rhinoviruses, collectively the most common cause of the "common cold" in adults, represent a smaller proportion of infections in young children because of the frequency of other viral respiratory infections. Also rhinoviral infections in young children often do not produce respiratory illness. However, rhinoviruses spread readily, producing illness in nursery and other school groups, and these children provide a major link in their spread within families. There are 111 serologically distinct rhinoviruses, all members of the Picornavirus family of small RNA viruses. They are best identified by inoculating human embryonic kidney or human diploid cell cultures with nasal secretions from infected individuals and waiting to observe a cytopathic effect. Routine serologic testing for acquisition of antibody is not practical because of the multiplicity of types and infrequency of their cross-reactivity. Several cross-sectional studies indicate that a low percentage of control children or children with diarrhea (1%) yield rhinoviruses at the time of sampling; similarly, only 2.2% of children with respiratory tract illness yield rhinoviruses. In longitudinal studies, however, 75% of pediatric rhinovirus infection is associated with illness, usually rhinitis or the pharyngitis-bronchitis syndrome. Rhinoviruses have also occasionally been associated with serious lower respiratory tract disease, particularly in infants with underlying illnesses. They are frequent precipitants of asthma in children and chronic bronchitis in adults. EPIDEMIOLOGY. Rhinoviruses are distributed worldwide with no predictable pattern of infection by serotype. Multiple types may be present in a community at one time. In temperate climates the incidence of rhinoviral infection peaks in September and again in April or May, but some infections occur year-round. The peak incidence in the tropics occurs during the rainy season. Rhinoviruses are recovered in highest concentration in nasal secretions, and experimental infection is most easily accomplished by nasal or conjunctival instillation. Infection via aerosol is less efficient. Virus persists for several hours in secretions on hands or other surfaces. Transmission probably occurs when infected secretions carried on contaminated fingers are rubbed into the nasal or conjunctival mucosa. More recent evidence also implicates spread through prolonged contact with aerosols produced by talking, coughing, or sneezing. The peak nasal inflammatory response occurs when virus growth is at its greatest, 2–4 days after experimental infection. Immune responses include specific nasal immunoglobulin (Ig) A and serum IgG antibody, which may contribute to modifying the illness and limiting viral shedding. Interferon and a nonspecific factor induced by infection with a heterotypic rhinovirus may be a part of the resistance mechanism. Usually the inflammatory response is limited to the nose, throat, and upper bronchial passages, but pneumonia has occurred. The primary clinical response to rhinoviral infection, like that to most respiratory viral infections, is the common cold. There is an incubation period of 2–4 days; then sneezing, nasal obstruction and discharge, and sore throat ensue. Cough and hoarseness occur in 30–40% of cases. Headache and other systemic symptoms are not as common as in influenza. Fever is neither as frequent nor as high as in primary infections with respiratory syncytial virus, parainfluenza virus, influenza virus, or adenovirus. Symptoms are worse in the first 2–3 days of illness and last for a week in a majority of patients; they persist for over 14 days in 35% of young children. These are like those of any infection causing edema and inflammation in the nasopharyngeal area. They include otitis media, sinusitis, local spread down the respiratory tract, bacterial superinfection, and, in certain atopic children, acute wheezing. In one study rhinoviruses were the most common virus recovered from the middle ear fluids of infants and children with otitis media. Because other viral agents can produce the same manifestations, a clinical diagnosis is only presumptive. Laboratory diagnosis is not practical under ordinary circumstances. If any question exists, bacterial cultures should be taken to exclude streptococcal infection. There is no specific preventive or ameliorative treatment. Careful hand washing and avoidance of manual nose and eye manipulation is the best approach to reducing spread. For relief of acute symptoms, a mild analgesic and saline or decongestant nose drops may be used for a short time. Interferon administered by nasal spray may be of value in preventing rhinovirus infection.